This is where the magic happens. I have had this sewing cabinet since we got married. A friend of the family showed me about 5 items in her home and let me chose which one I wanted. I chose this Ethan Allen sewing cabinet. It’s got room for my sewing machine when it isn’t in use, and lots of drawers for sewing notions, while the door holds spools of thread. I always wanted to paint the cabinet but never got to it, until now. I wanted the guest quarters to have a cottage feel, and the stain on this piece wasn’t working for me. I painted the cabinet using homemade chalk(y) paint. You can find recipe below. I haven’t waxed it yet, but I hopefully by the time you read this it will be done. The whole concept of having a sewing room, a sewing cabinet, and a sewing machine seems so old fashioned and strange these days. I don’t know many people who sew. Most of my friends don’t. I use my sewing machine A LOT. I made… lots of bedding, many, many slipcovers, curtains, shower curtains, cushions, and pillows. You can check out my sewing projects below. The blinds in here were provided by my friends at BLINDS.COM. 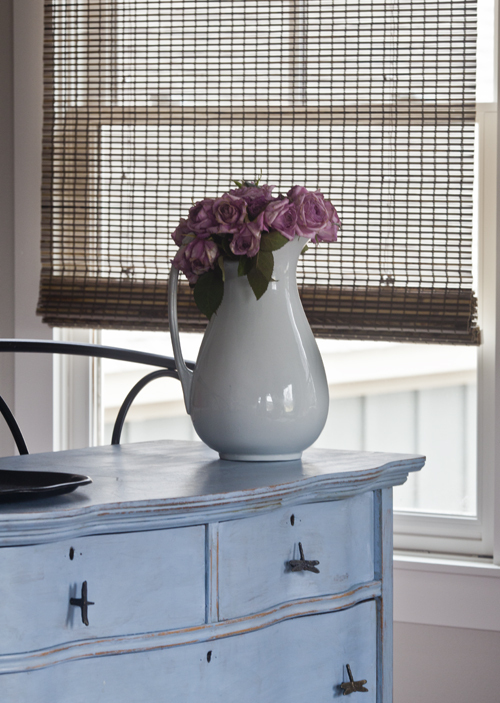 They have a great selection of window blinds, shades, and so much more. Want to know which blinds I used? You can find that information in my post here. I love the look of this room and hope to do the same and turn what has become a “junk” room for me into a craft room. Is the white latex paint you use a flat paint and is it just white or a certain shade of white that you prefer? I hope you have many happy hours of sewing! Philomena, I use flat paint, and I don’t have a certain shade I use, but it is a creamy white. The sewing cabinet looks so much better Anita, nice job. I hope you’ve gotten a lot of requests to show a video on making slip covers because I would really like to have it available. Thank you. 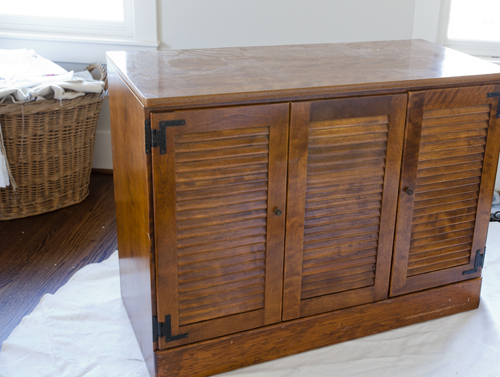 I really love what you did with that gorgeous sewing cabinet. The whole room looks wonderful! I sew myself and love it and don’t think it’s something I would every give up. It is a shame more folks don’t sew, isn’t it? What a beautiful (and useful) cabinet and gorgeous room to keep it in. I had a sewing room in my last house and I really miss it. I will hopefully have one again when my daughter leaves for college. Like you, most of my friends do not sew but it’s a skill that I am so thankful I possess. Maybe someday I will teach my friends this skill so they will stop asking me to sew for them. hahaha. It’s so pretty with it’s new coat of paint. I use my sewing machine alot too. I actually have two. whenever I start to sew at least one of my three girls will show and start to make something from my scraps. I find it so fun to hear both machines whirling at the same time. I only have a couple of friends that sew, but I taught my daughter and she still sews as an adult. My grandmother taught me to sew when I was about 6 or 7, so I have been sewing over 40 years now! I currently have a booth in a mall store tea room in my little East Texas town and I make children’s clothes, handbags and bedding accessories. I can’t imagine my life without sewing! And I am so grateful to have a sewing room! 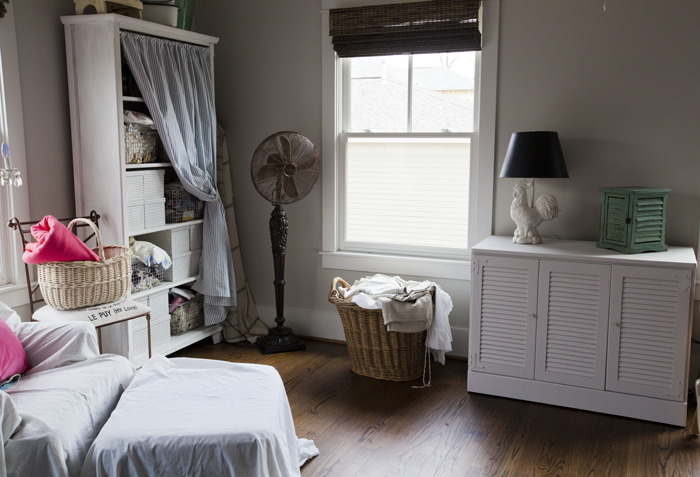 Love your guest quarters and that you have a quiet place to go do your sewing! Ok..I cant remember your name…is it Erica or Anita?! LOL….swanyways….so gorgeous!! I have to FINALLY give that chalk paint a try! I have quite a few furniture pieces I found at garage sales last year and cant wait to start them and resell them!! I have done a coffee table, but need to redo the top. It has laminate on it and bubbled up. I fugured instead of trying to take it off, I would paint over it..well…ICK!! LOL I ‘distressed’ it to make it ‘look’ like I ‘meant’ it to look like that! LOL…so….off I go to check out and write down your recipe for chalk paint!!! Thanks for a great entry today!! So cute! I use a desk right now for my sewing machine – it’s never put away anymore. And someday I hope to be able to design my own sewing room and sewing cabinet – my business needs it! This piece adds so much charm and I love it painted. As I have told you many times, if I only knew how to sew. None of your friends sew? Tons of people I know sew. But I live in a cold climate and quilting is big. very nice room, anita! i wish i had the patience to sew. LOVE the white pitcher with roses, too! Charming idea for a sewing cabinet. Maybe someday I’ll get to move mine off the old computer desk it’s on and into something pretty!. Lovely room for sewing and guests! Even though none of my friends sew there are a lot of closet sewers out there in blog land. I recently took up machine embroidery and love it. I’m lucky to have a separate dedicated sewing craft room.